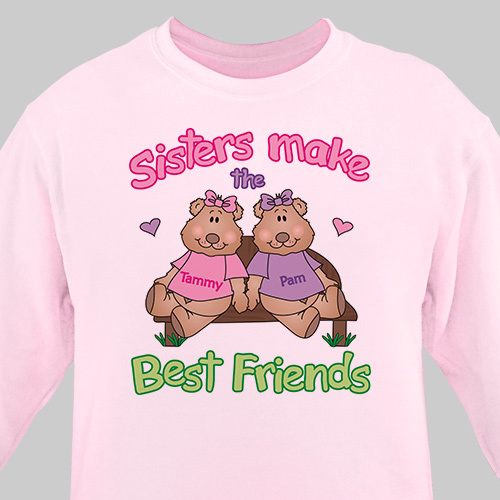 Your Sister is your best friend and she will love receiving one of these Sisters Personalized Sweatshirts from you to celebrate being best friends. Make it a wonderful gift for her upcoming birthday or Christmas. Our Sisters Personalized Sweatshirts are available on our premium white cotton/poly blend Personalized Sweatshirt, machine washable in adult sizes S-3XL. Includes FREE Personalization! Personalize your Sisters Sweatshirt with up to 4 Sisters names. Love it. Bought it for my sister for Christmas. I bought this for my sister's birthday gift. She loved it...the only problem is that the LARGE was MUCH LARGER than any shirt she has and cannot wear it at all. She tried washing it in very hot water and drying it in the dryer on high heat...it did not shrink. Again, she loves the shirt, but unfortunately, she'll never wear it -- and I'm not happy about that! I do love everything else I received from you and do plan on shopping again. Easy gifts for hard to buy for people! Browse & shop GiftsForYouNow.com for all your Sister Gifts & Friendship Gifts and show your Sister how much she means to you. GiftsForYouNow.com also carries additional Personalized Sister Gifts. GiftsForYouNow offers many creative personalized keepsakes for your friends.